At ground level on Willow Avenue the hand directs the passerby: Marcus Brush Co. Entrance Around the Corner. The proprietor of the Marcus Brush Co. was Michael Morris (1876?-1955). The company had its roots, however, in an earlier brush manufacturing company called Marcus Bros., when Michael Marcus was in business with his brothers, Harry Marcus (1889-?) and Morris Marcus (1887-?). All three were probably involved with Marcus Brush Co. also. Marcus Bros. was listed in directories in 1920 and 1922 at 174 East 111th St. in Manhattan, and then as Marcus Bros. - Zias at 445 East Tremont Avenue in the Bronx in 1925. Meanwhile, Marcus Brush Co. began in 1922 at 174 E. 111th St., and moved to Willow Avenue and 135th Street in 1925. They were in business here only to 1930, when bankruptcy was announced in the New York Herald Tribune, 12 Oct. 1930, pg. D8, "Bankruptcy Proceedings: Marcus Brush Co., Inc., 749 East 135th St., the Bronx. Voluntary, without schedules." 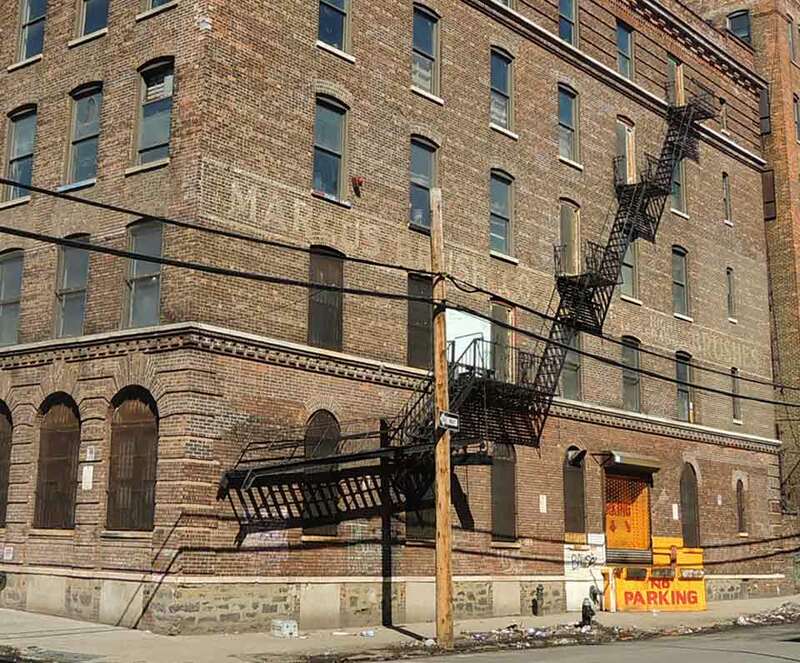 The Marcus Brush Company was followed in 1930 by the Acme Brush Company, located initially at 707 Broadway near West 4th St. and later in Long Island City at 27-17 Jackson Avenue. The Acme Brush Co. was listed in directories from 1930 through 1978. Harry Marcus and Morris Marcus registered for the World War II draft in 1942 when employed at Acme Brush Co., 707 Broadway. Michael Marcus registered for the World War I draft in 1918 when he declared that he was born August 1876 and that he was a brush manufacturer in business for himself at 174 E. 111th St, New York City. In 1920 he applied for a passport where he said he was born in Minsk, Russia, 15 July 1876. Attached to the application was an affidavit with the letterhead Marcus Bros., High Grade Brushes, 174 East 111th Street, New York. The attachment was signed by Harry Marcus and Morris Marcus. Michael Marcus's birth date is confused by his World War II draft registration which said that he was born 17 April 1880, Minsk, Russia. The Zias in Marcus Bros. - Zias was Benjamin Zias (1897-1983). Harry Marcus married his sister, Rose Zias, in 1923.